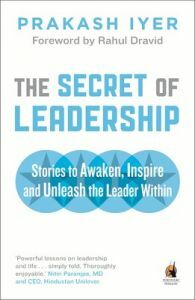 Bestselling author Prakash Iyer uses simple but powerful anecdotes and parables from all over the world to demonstrate what makes for effective personal and professional leadership. Iyer draws lessons from sources as diverse as his driver, a mother giraffe, Abraham Lincoln and footballers in the United Kingdom. He shows how an instinct to lead can be acquired while flipping burgers at a fast food chain. All of these stories come together in an explosive cocktail to unleash your inner leader. Prakash Iyer is the bestselling author of the Habit of Winning. In a corporate career spanning more than twenty-five years, he has worked with teams selling everything from soaps and colas, to watches, yellow pages and diapers. He is currently the managing director of Kimberly Clark Lever. Passionate about people and cricket Prakash is also a motivational speaker and trained leadership coach. An MBA from IIM Ahmedabad, he is married to Savitha and they have twin children, Shruti and Abhishek.